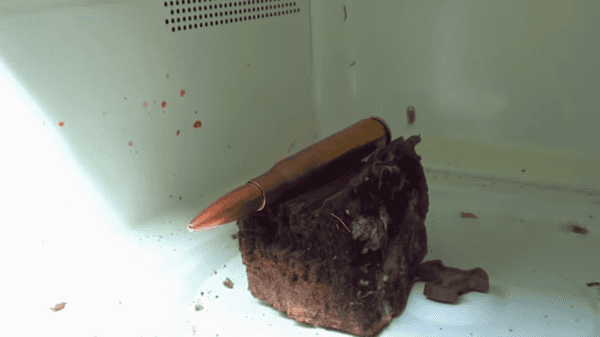 Ever wonder what happens if you put a 50-caliber round in the microwave and turn it on? Whether you have or haven’t, you’ll probably find this video to be interesting. Once you watch, you’ll see why this is a stunt that shouldn’t be attempted at home. Though it’s a pretty slow start with just a lot of smoke coming out, the show begins to speed up as soon as the microwave door shoots open. 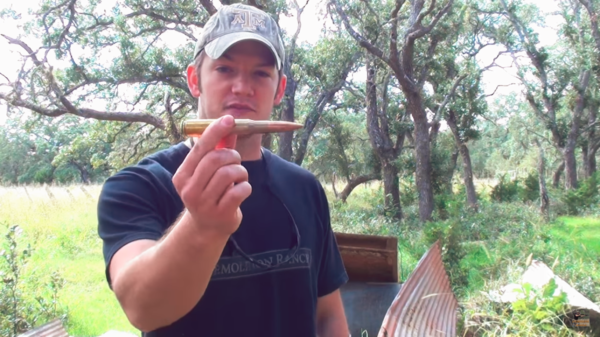 The video, which is by “Demolition Ranch” starts with the host, Matt, showing off he .50 BMG to the camera. The actual round itself, is quite large and is commonly fired out of the Barrett M82A1 sniper rifle. After providing some details about the round, the host shows off the apparatus that he put together for the experiment. He created what he calls a “microwave bunker,” which consists of about a dozen dirt-filled cinder blocks that surround the microwave. The purpose of the bunker is to mitigate the risk of dangerous explosions occurring while the ammunition is being microwaved. Next, Matt puts the .50 BMG in the microwave on top of a piece of wood to prevent it from spinning around. He sets the time on the microwave for five minutes and hits start. After several minutes, smoke appears to be coming out of the microwave and eventually the time on the microwave runs out. After waiting for five more minutes for the smoke to die down, he opens the microwave to see what happened to the 50-cal. To his dismay, all the smoke was from the piece of wood that the ammunition was resting on. The microwave caught the wood on fire and didn’t do anything to the 50-cal. After removing the wood, he decides to run the microwave for another five minutes without the wood, leaving only the .50 BMG cartridge inside. With three minutes left on the timer, the ammunition suddenly explodes resulting in the microwave door being violently ripped off. The explosion results in the round being completely obliterated with the shell and bullet coming apart. 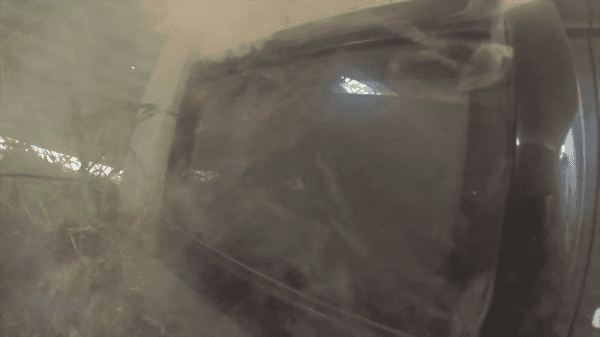 Lots of unburned powder scattered throughout the inside of the microwave during the explosion. Demolition Ranch then ends the video by showing the explosion in slow motion. It’s amazing how destructive the explosion was to the microwave.